Click here to visit the Dial facebook and like them. Then on the “65th Celebration” tab, click “Enter Now,” and fill out the form to enter their sweepstakes. 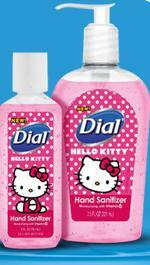 65 winners will score a free full size bottle of DIAL Hello Kitty Hand Sanitizer. You can enter daily through August 30th. Good luck! i hope i win something! i never do!